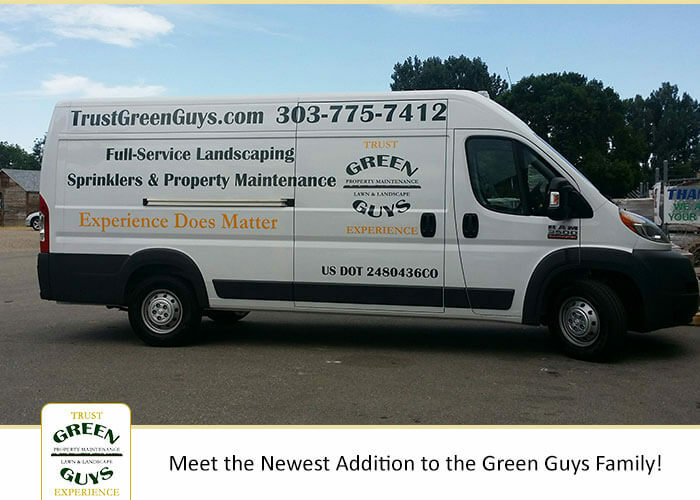 At Green Guys we’re constantly looking for ways to serve you better… and this month we’ve added a member to the Green Guys team: a brand new van! This addition makes us better equipped to provide our lawn and landscape services to our valued customers. With plenty of storage for tools and materials, this new van will make us even more efficient and capable to handle any and all landscaping and sprinkler system support. How will this new van make Green Guys even better? Before we added this new van, we sometimes came across a sprinkler repair where the replacement part was not a common one. We then needed to locate a distributor of said part to make the proper repair, and if it was not immediately available, we needed to order it and conclude the repair at a later date. With the heat we have experienced in Colorado this year, the latter was not always the best solution. But, Green Guys is not like many other companies out there who just take some similar part out of the inventory and hope that it will solve the problem. We like to do it right. Now we can inventory more parts that allow us to service, repair, maintain and/or upgrade all types of sprinkler systems without delay. This makes us faster and more efficient, and provides you with the best customer service around. Call (303) 775-7412 or Request a Quote from Green Guys today to see the difference that our attention to customer satisfaction can make for you and your lawn.